For Michael’s going away dinner he decided on Mindong Korean Gourmet since last time we tried to go we couldn’t get a reservation. I called on Wednesday night to make a reservation for 7pm on Saturday night for six. They said they were booked, but could get us in at 7:30pm. Needless to say, reservations are kind of a must for Mindong on the weekend, so be warned. 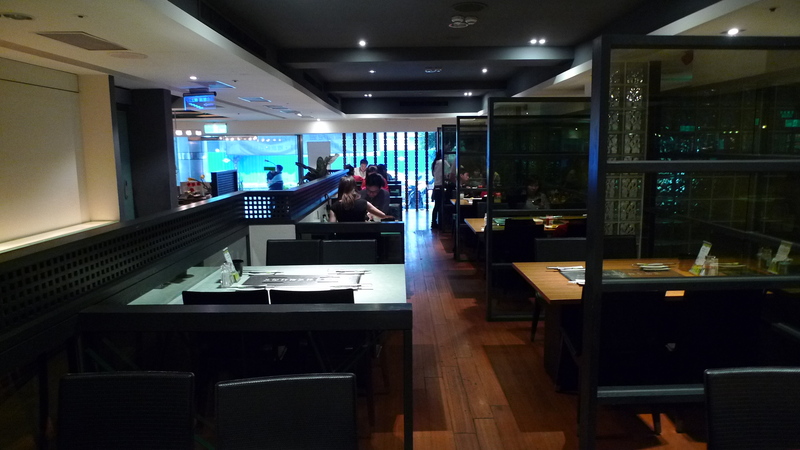 Mindong is only a few minute walk from the Zhongxiao Fuxing MRT station (忠孝復興) exit 5. The restaurant called me a few times just before 7:30pm to make sure we’d be there on time. I was about 10 minutes late, but two of my friends had gotten there on time and were told that they had to wait for the rest of our party to get there before they could get seated. Once I got there we were immediately seated; I think just the majority of your party just has to be there. The menu at Mindong is in Chinese, Korean, Japanese, and English, although the English may not be very helpful unless you are familiar with Korean food names, as they are mostly just transliterations of the Korean. 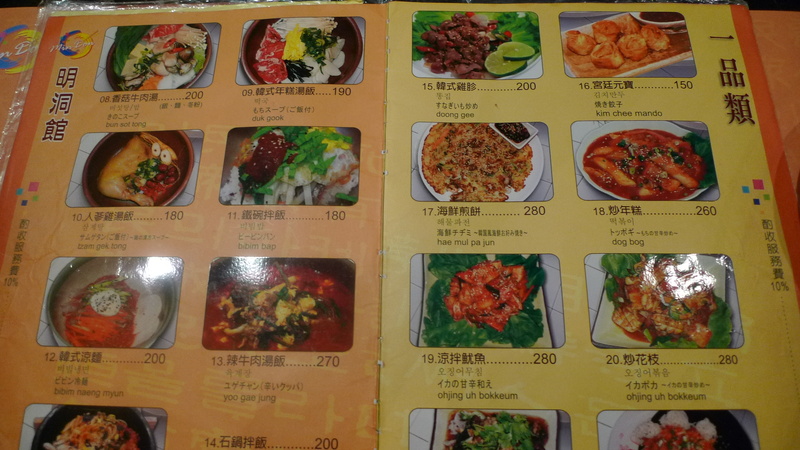 For those unfamiliar with Korean food names you’re in luck because every item on the menu is accompanied by a picture. 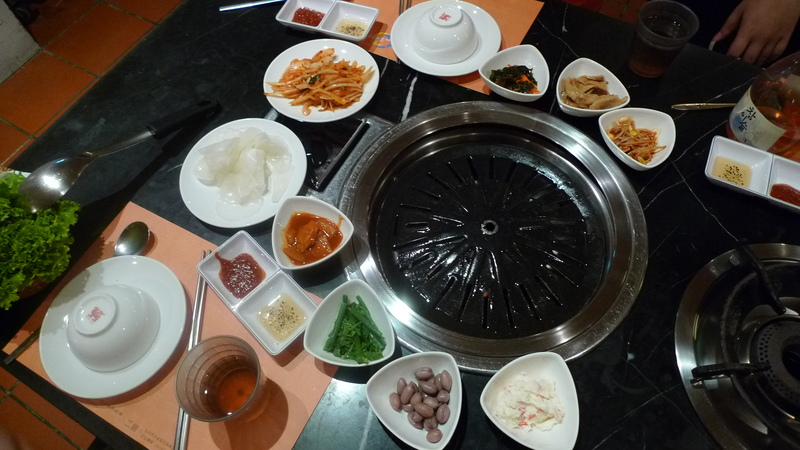 First thing to come out was the banchan (side dishes). At first we weren’t sure if the meal came with the banchan or if we had to order it because we saw it on the menu for 50NT. I think that it comes with the meal, but if not, it’s only 50NT. The weirdest thing about the banchan was that we didn’t get any cabbage kimchi…this is literally the first time in my life that I’ve gone to a Korean restaurant and not gotten any cabbage kimchi. Anyways, none of the banchan was particularly outstanding or memorable; it was all pretty average. We ended up getting seaweed, fish cakes, bean sprouts, potato salad, peanuts, some green vegetable, something else I didn’t get to try, pickled radish, and kimchi onions. My favorite was the kimchi onions. It had a good vinegar, sweet, and salty combination although it could have used more spice. We asked the waiter which of the starters he recommended. He recommended the hae mul pa jun aka seafood pancake (海鮮煎餅) for 280NT, dog bog aka rice cakes (炒年糕) for 260NT, and san dong shaw g aka Shandong chicken (山東燒雞) for 280NT. Mike decided on the san dong shaw g aka Shandong chicken. I thought this was pretty tasty. The chicken was really tender and had great flavor. The sauce was a tasty sweet vinegar and garlic mixture. I really liked the cucumber in it because it kind of soaked up the sauce. I would get this again. 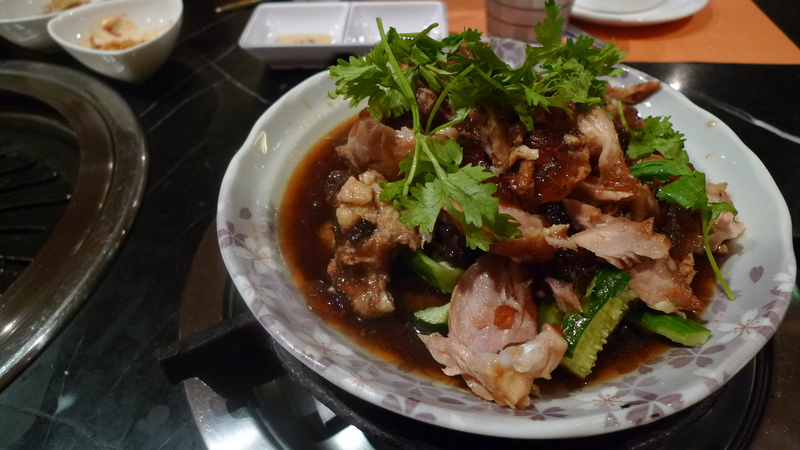 The So Gee Set Kul aka Assorted BBQ (小燒烤總匯) comes in either a small or large portion. We asked the waiter what size we should get since we were going to split it between the four of us and get other things as well. The waiter suggested the small portion for 650NT and I think it was a good suggestion. While there isn’t a lot of meat, it’s a good portion if you’re planning on getting other things. I thought all of the meat was pretty good. I kind of wish we would have gotten some galbi or bulgogi, something marinated, but these cuts of beef were pretty good, too. Each of us were able to have one slice of each cut and all was pretty tender, just don’t over grill it. It also came with lettuce, shiso leaves, garlic, and peppers to wrap the meat in. 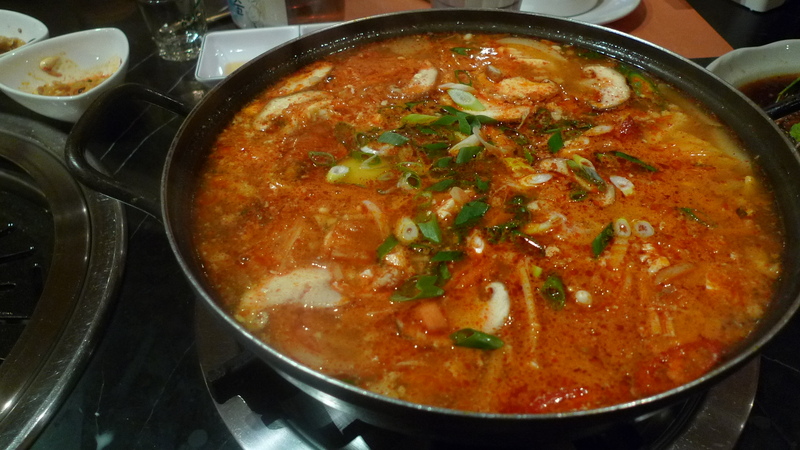 We also got the soon doo boo jigae (豆腐火鍋). Like the bbq meat this also comes in two portions. Again, on the recommendation of the waiter we went with the small for 450NT. I wasn’t that impressed with this sundubu. I thought the soup itself was not as flavorful as other sundubus I’ve had. 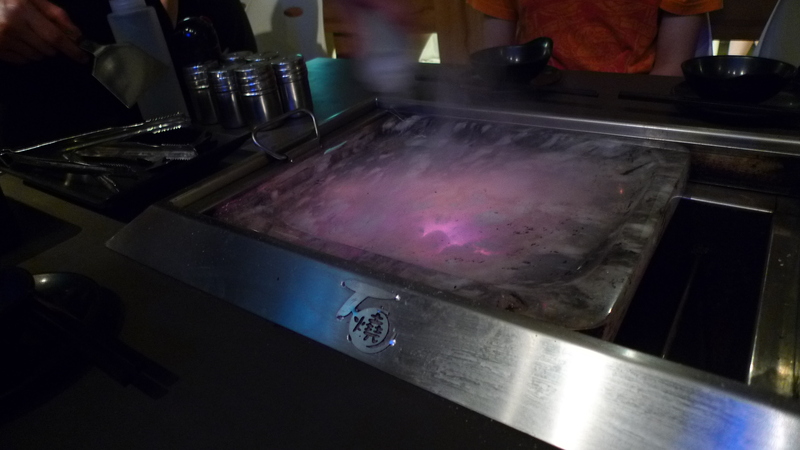 Mike and I both agreed that the sundubu at Gyeongju Korean Restaurant was better. When you order the sundubu you can choose how spicy you want it (1-3, 3 being the spiciest). We went with 1 since some of our party can’t handle too much spice. Maybe with more spice this would have been better, but as it was I just felt like the soup lacked depth, not enough seafood flavor or something. Regardless I thought this was still good, just not great. Since Will was late and we had started without him, we decided to add another dish so Will could get a little more to eat. 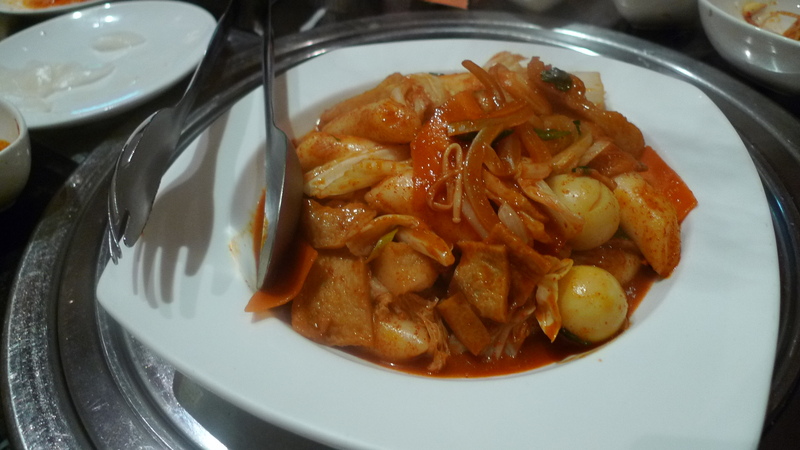 We went with the dog bog aka rice cakes aka tteokbokki (炒年糕) for 260NT. I’ve never seen tteokbokki aka rice cakes translated at dog bog, but that’s what it is on the menu at Mindong. I thought their rice cakes were pretty tasty. The sauce was pretty standard. I thought the rice cakes were cooked pretty perfectly: nice and chewy, very “qq”. To end the meal there is a freezer of self-serve ice cream. 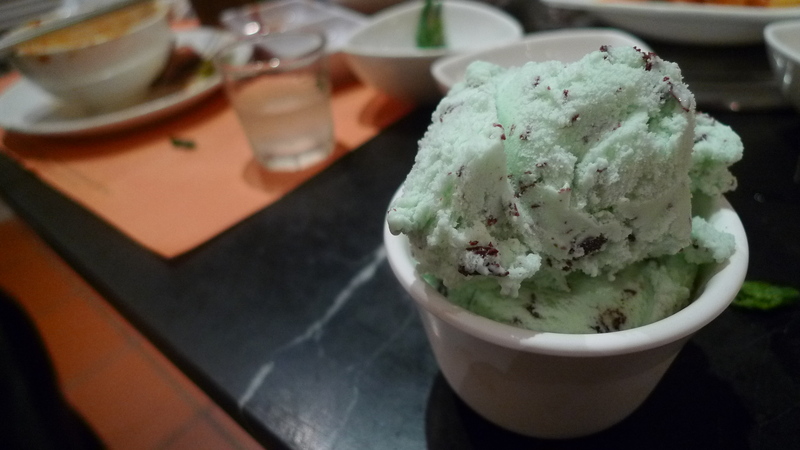 I went with the mint chocolate chip, but there were 5 or so other flavors as well. 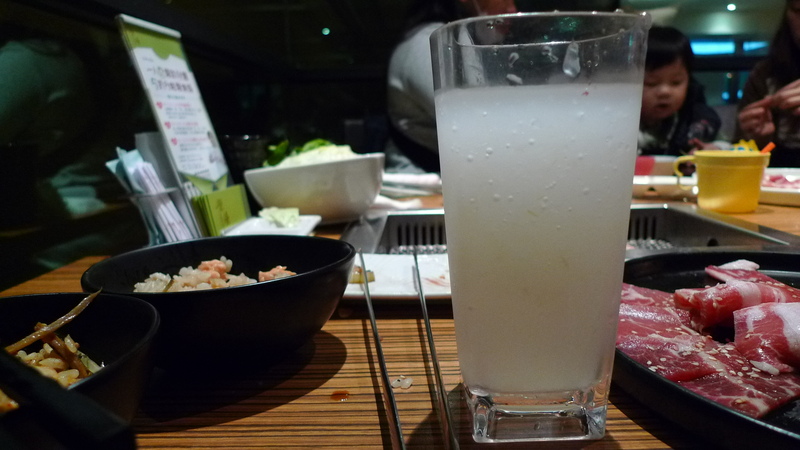 We also ordered a small jug of peach soju (真露(水蜜桃)) for 350NT. They have about 5 flavored sojus on the menu so we asked the waiter which he thought was the best and he suggested lemon or peach. We decided on peach. Generally I don’t like soju. I feel like for as low as the alcohol content is it tastes pretty terrible. This peach soju was okay, but I wouldn’t want to get it again. Maybe if you like soju you’d like this, but for me this was a miss. Overall, I thought Mindong was pretty good. There were a lot of other things on the menu that I’d like to try, so hopefully I’ll come back to Mindong to try them. I noticed that Mindong has a second location located at No.40-2, Lane 223, Sec. 4, Zhongxiao E. 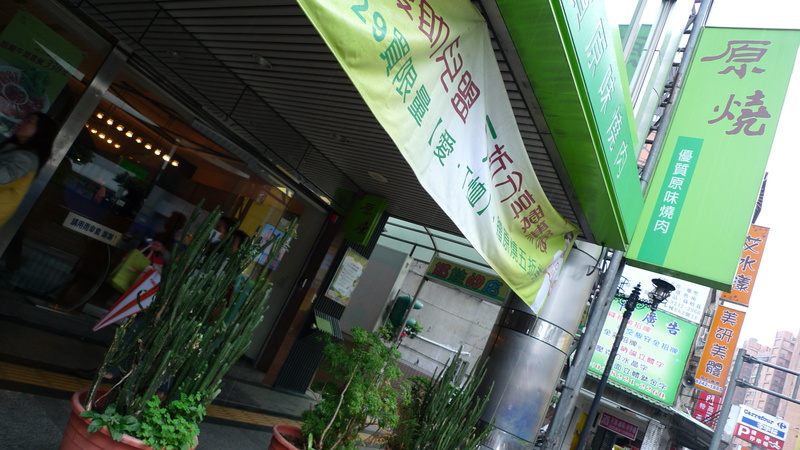 Rd., Daan District, Taipei (台北市大安區忠孝東路四段223巷40號之2). Maybe I’ll try that location, too. 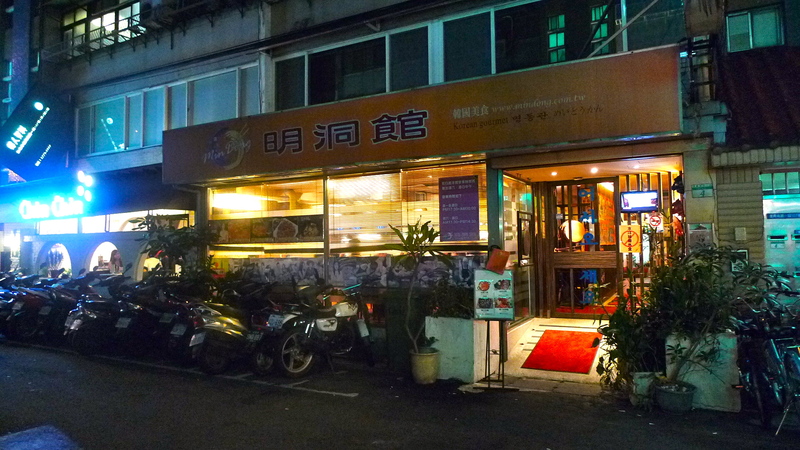 Tian Ji Stone BBQ is located about a 5 minute walk going south on Fuxing N. Road from Zhongshan High School MRT station. I highly suggest making reservations, because even though this place is really big, it’s also very popular and very busy. We made reservations for 7pm for 6 and were sat almost immediately upon arrival. 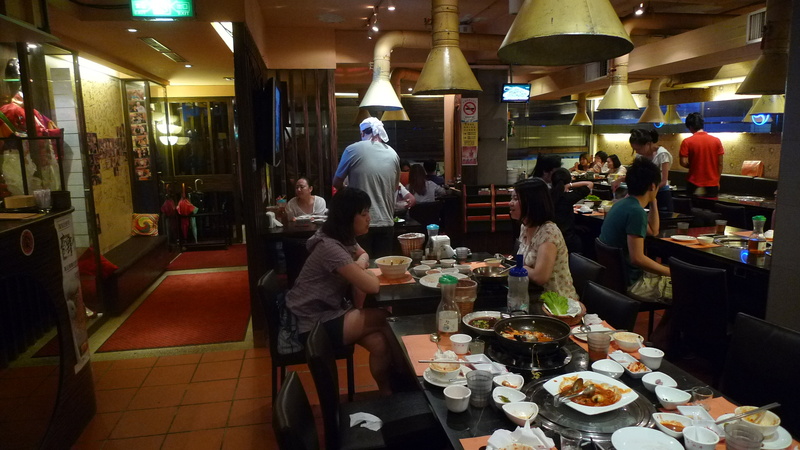 Each table seats four people and comes equipped with a giant stone grill and a small gas burner with a bowl of water to boil vegetables in. We asked what kind of stone it was and he said 水晶 something (some kind of crystal). Upon sitting, an employee came to show us the “proper” method of grilling on the crystal slab. We were told to squirt some water on the meat to keep it from sticking to the stone and then squirt water on the crystal to cool it down. Everything is self serve. They seemed to do a pretty good job of keeping everything well stocked. 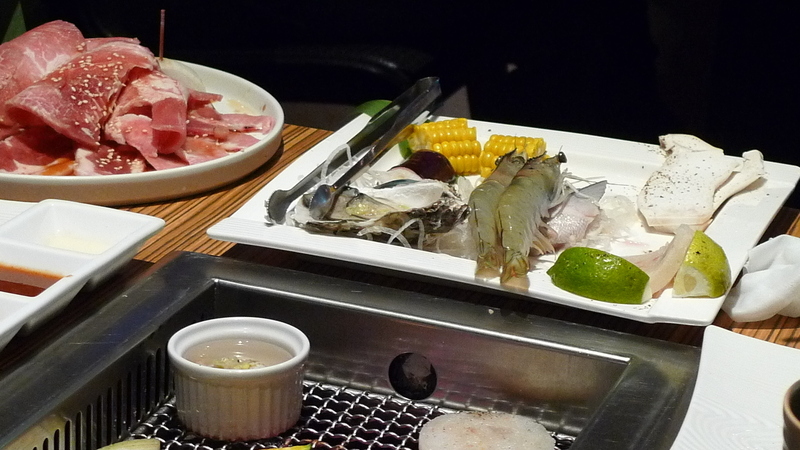 There was a lot of seafood and meat (pork, chicken, and beef). They had a decent selection of vegetables as well. 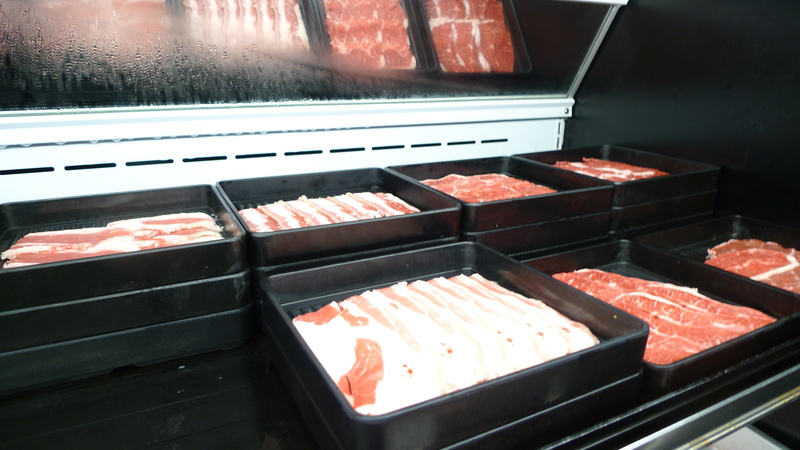 There was a large selection of different cuts and types of meats. Everything we had was good. Drink wise there was a pretty decent selection. They had mini cans of 7-up, Pepsi, Pocari Sweat, and some tea. They also had dispensers with juice, water, and tea, as well as calpis slushy dispenser. Dessert wise they only had frozen yogurt. The frozen yogurt was not very creamy, more icy, but really, I didn’t mind considering that we all ate a lot and creamy probably wouldn’t have made us feel any less full. 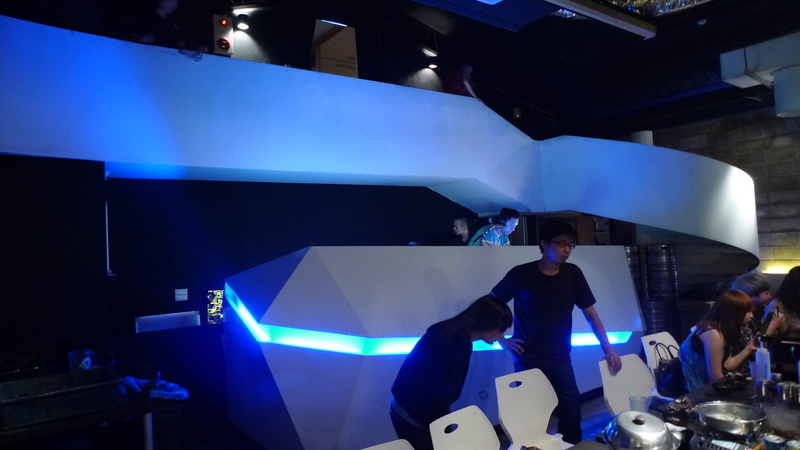 The DJ station is at the back of the restaurant. They did a lot of birthday shoutouts, but mentioned something about not really taking requests because there were too many to accommodate. 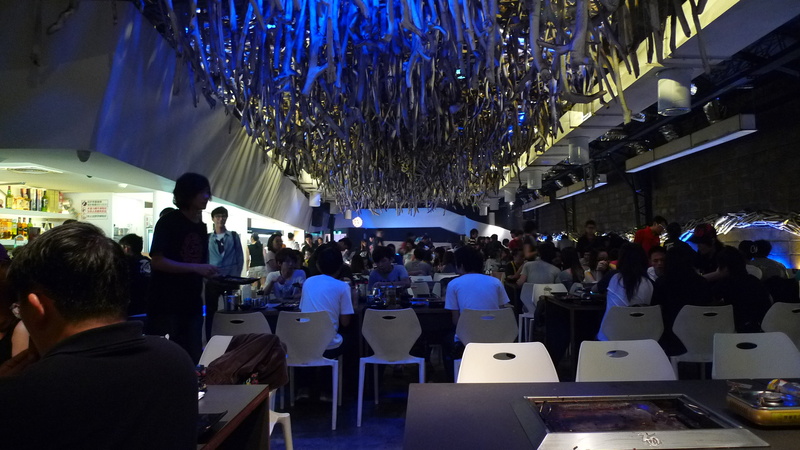 They played a wide variety of music: American hip-hop, Taiwanese pop, 90’s rock, lots of random stuff. Sometimes I felt like I was at a club, other times I felt like I was at a wedding reception. Overall, this place is pretty cool. Kind of a fun atmosphere. Good place to get dinner with friends, celebrate something. The food is good, the price isn’t bad, and it’s a fun place to be. My family randomly calls me and tells me to be ready in 10 minutes because they’ve made reservations that are in 30 minutes. My first experience at Yuan Shao (原燒) was a result of one of these early morning phone calls. For my cousin’s son’s second birthday, we celebrated by eating at Yuan Shao. The Zhonghe location of Yuan Shao is not really near any MRT station. It’s between Yongan Market (永安市場) and Jingan (景安), but even then, it’s not close. 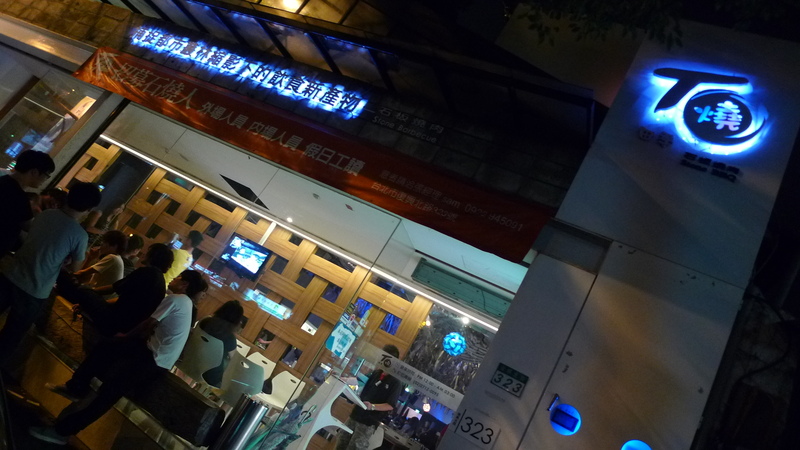 It’s located close to the Zhongshan/Jinping intersection (中山景平路口), across from the large Carrefour/Hola building. There is a decent amount of seating at Yuan Shao. I think I saw that there is a second floor as well. This picture is misleading in terms of seat availability. I highly recommend making reservations. This picture was taken as they were closing for the lunch/dinner break, so it’s pretty empty; however, earlier it was completely full. 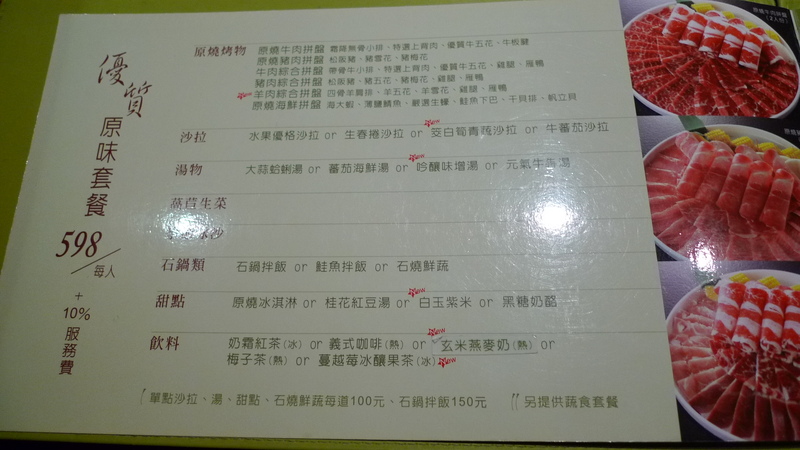 They have menus in both Chinese and English. 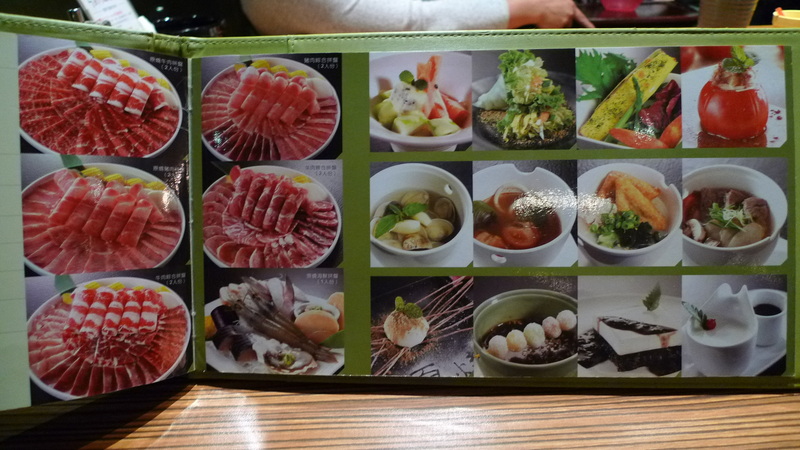 Also, they have a full picture menu, which is awesome. The set meal has 7 parts: main meat, salad, soup, slushy drink, stone pot dish, dessert, and drink. I did see that you can order things a la carte as well, but it seems like everyone orders the meal and just adds things if needed. For my meal I chose the Yuan Shao assorted beef platter, tomato beef salad, garlic clam soup, lemon slush, salmon mixed rice, tofu purple rice dessert, and black tea with milk foam. Salads were served first. 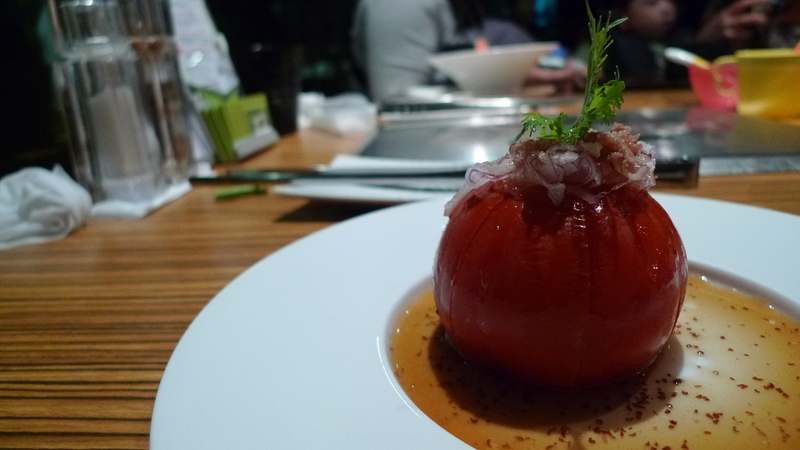 The tomato beef salad (牛蕃茄沙拉) is literally a whole tomato sliced served with pickled onion shavings and a sprinkle of beef with a vinaigrette. I really liked this. The vinaigrette was a good balance of sweet and tart and not oily. The sprinkle of beef provided the salt for the dish. It actually kind of reminded me of bacon bits, but beef bacon bits and pickled onions can really never go wrong. 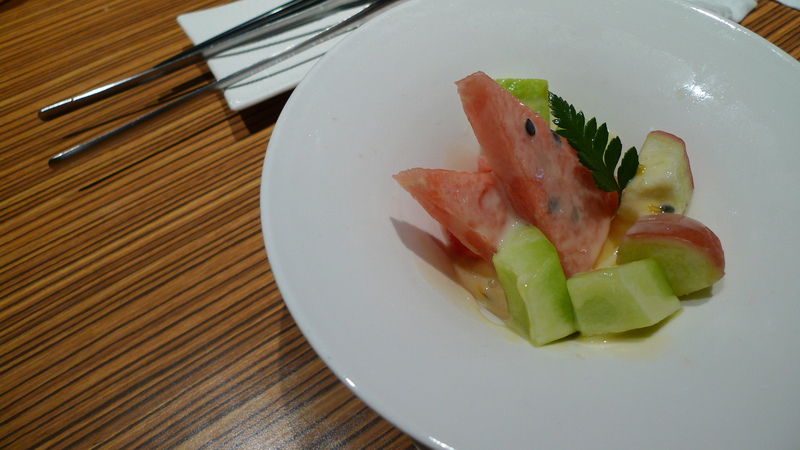 My aunt and cousin got the fruit yogurt salad (水果優格沙拉). I didn’t have any, but it looked pretty, but standard. 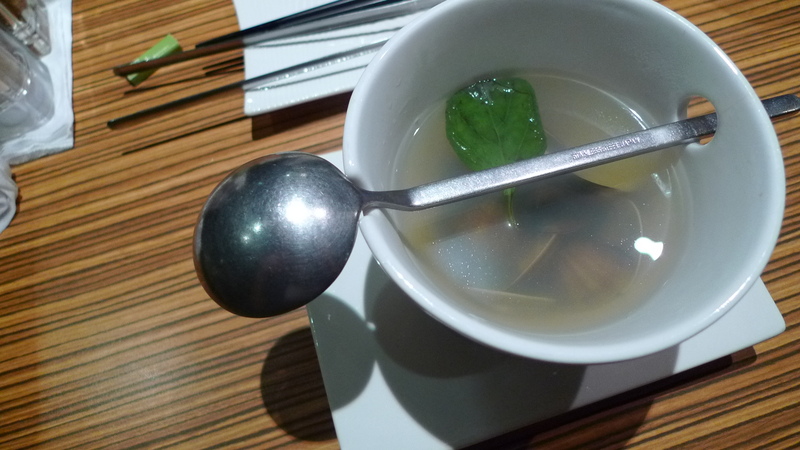 The garlic clam soup (大蒜蛤蜊湯) was pretty good. The were whole cloves of garlic and a lot of clams. Overall there was a pretty good balance between the garlic and clam flavors. There was also a basil leaf that added a subtle basil flavor, too. It might have been a little on the salty side, but for me it was fine since I like salty foods. 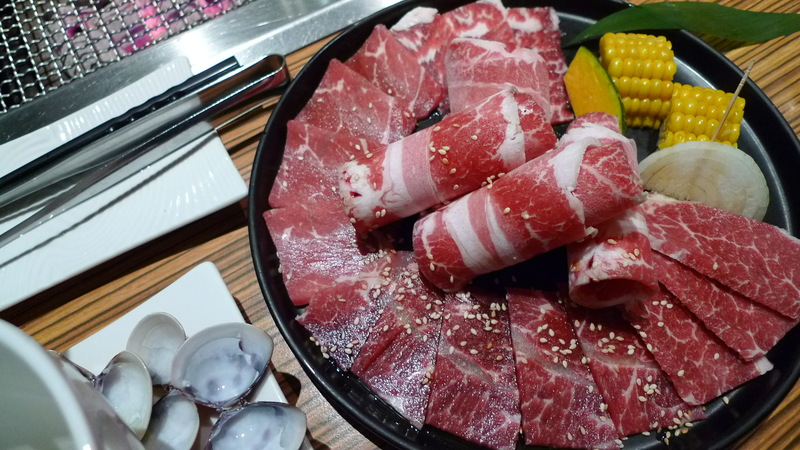 I decided to get the Yuan Shao assorted beef platter (原燒牛肉拼盤). I was the only person to order beef. It was really good. The servers give you tips on how to bbq your meat. She recommended that I place the beef on the grill, sprinkle a little salt on it, grill it for about 10 seconds, flip it, grill for another 8 seconds, then eat it. It was delicious. I can’t remember what kinds of beef was part of this assortment, I only remember that it was 4 different kinds. 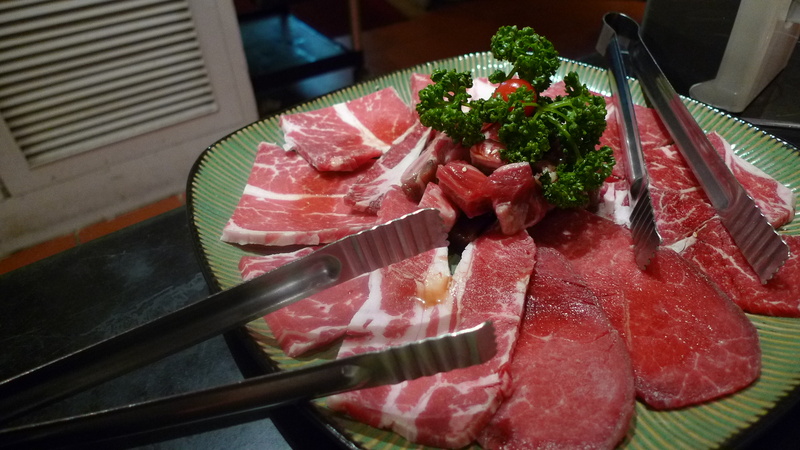 My cousin and aunt ordered the Yuan Shao assorted pork platter (原燒豬肉拼盤). 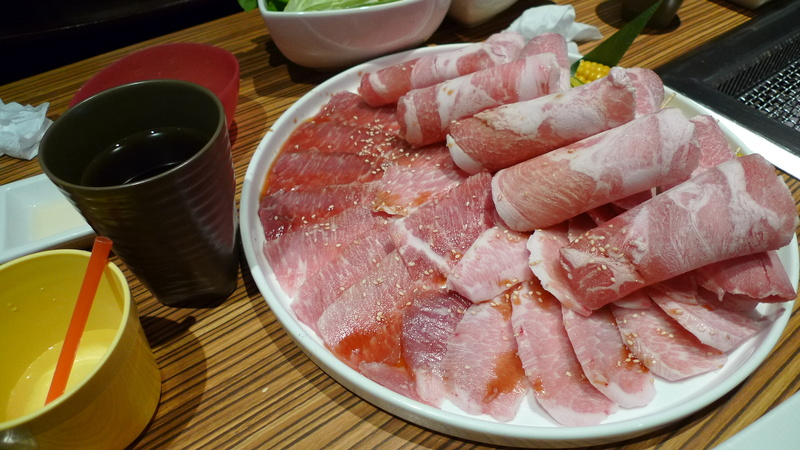 The server recommended that the pork be throughly cooked before eating it. Like the beef, she recommended that a little salt be sprinkled on during the grilling. I ate some of the pork as well and it was all delicious. 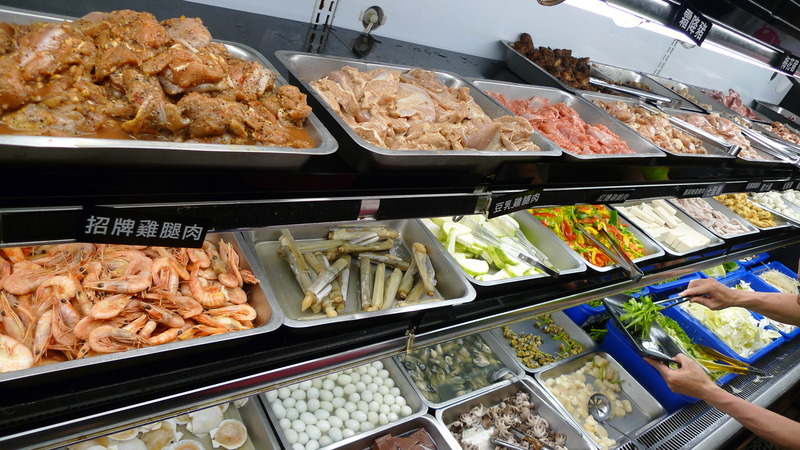 My cousin told me that the Yuan Shao assorted seafood platter (原燒海鮮拼盤) is new. They used to only have beef, pork, and chicken, but now they have seafood for those who do not eat meat. 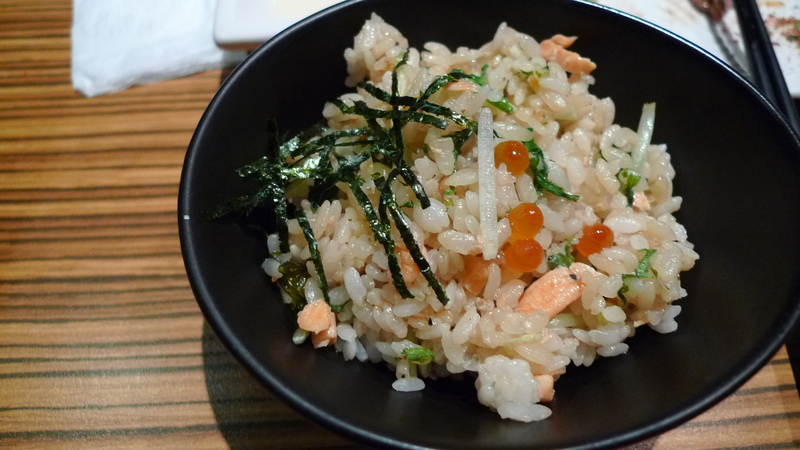 For the stone pot dish I chose the salmon mixed rice (鮭魚拌飯). They mix the rice in a stone pot for you at the table, then scoop it out into two bowls, probably to save space and so that you don’t have a hot stone pot at your table. I love salmon, so I had to chose it. They ask you if you eat fish eggs or not before they add the salmon roe, so for those who don’t, you can leave it out; however, the rice is not heavily seasoned, so if you want the extra salt, the roe helps. The rice was lightly seasoned, which was good since you have a lot of meat to eat with it. My cousin got the stone pot bibimbap (石鍋拌飯). 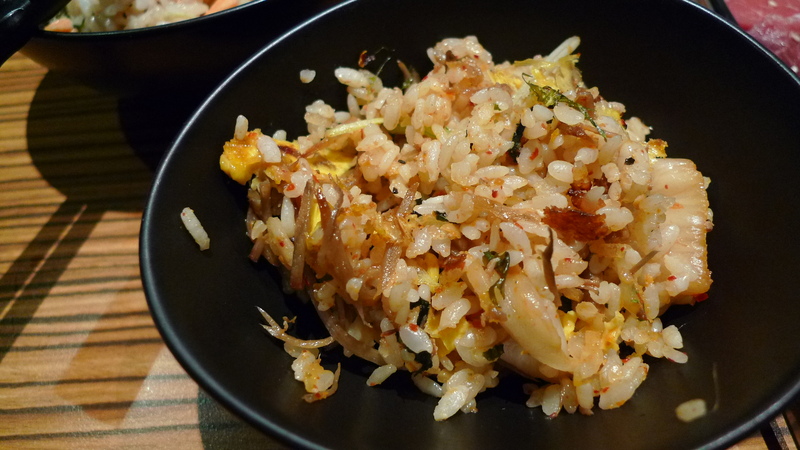 It is like korean bibimbap, just without a lot of veggies or any meat. There is kimchi and egg, though. Since they make the rice for you table side and split it into two bowls, my cousin and I traded a bowl each. The bibimbap had more flavor, but I think I preferred the salmon rice. Part of the meal is a seasonal slushy (季節冰沙). Currently the flavors are lemon and cranberry. I got the lemon. It tasted like it had little aloe bits in it or something. Either way, it was pretty good. Good balance of sweet and tart, pretty refreshing. Also, you can get refills of the slushy for free. 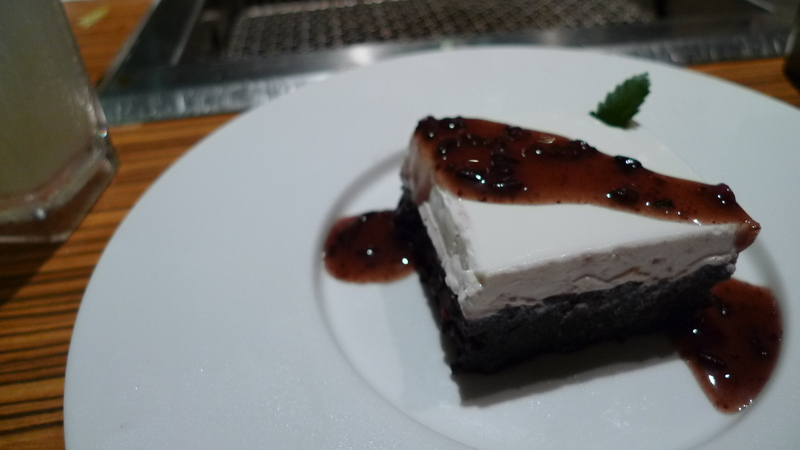 I decided on the tofu purple rice dessert (白玉紫米). This was delicious! The top tofu tasted like it was flavored with vanilla or something. 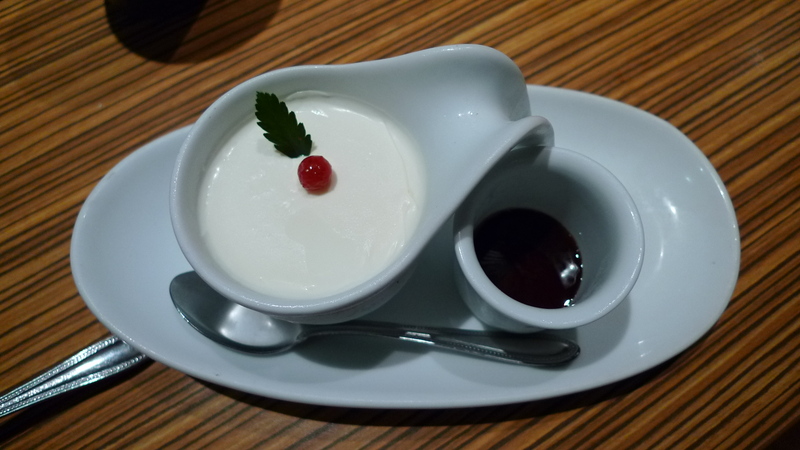 Although it’s supposedly tofu, it tasted more like milk pudding or panna cotta. The bottom layer of purple rice was a mixture of purple rice and red bean. 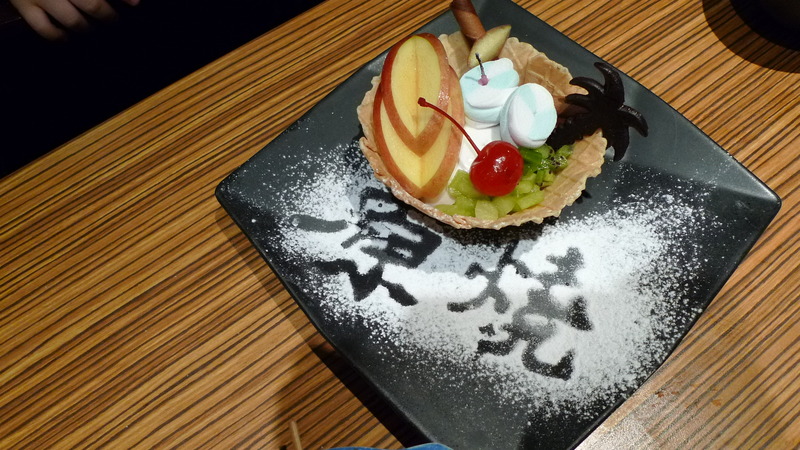 I really liked that this dessert was not very sweet, yet still really satisfying as a dessert. My cousin’s husband opted for the milk curd with brown sugar (黑糖奶酪). I didn’t have any, but it looked good. My aunt, cousin, and the nanny got the red bean soup with osmanthus flower (桂花紅豆湯). 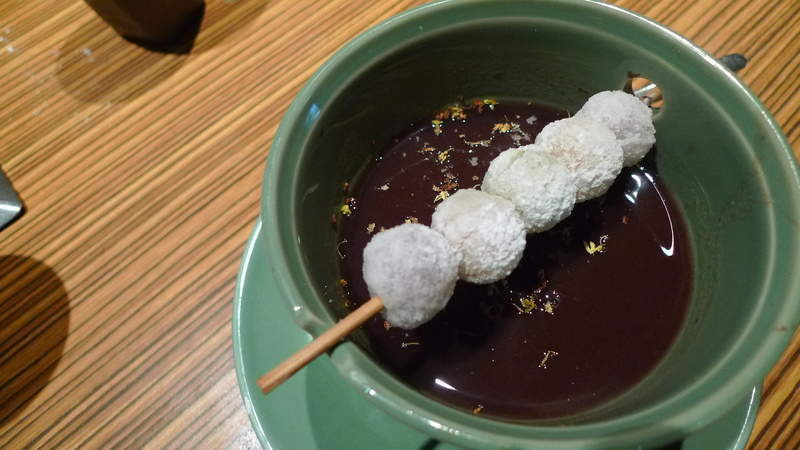 Along with the soup came a skewer of fried rice balls (炸湯圓). I didn’t have any soup, but my aunt gave me a few of the rice balls, which were lightly crisped on the outside and nice and chewy, or qq, in the middle. 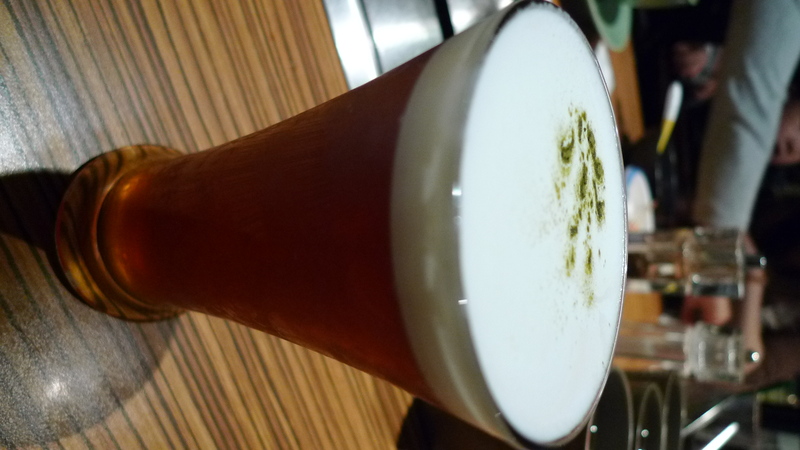 For my drink I got the black tea with milk foam (奶霜紅茶). When I chose my drink I was expecting milk tea, so when it came out looking like a pint of beer with a nice head on it I was confused. We were told not to mix it and to just drink it as it was. It’s kind of awesome the way it works. The milk foam on the top mixes into the tea when you drink it, so while it doesn’t look like milk tea, it tastes like milk tea. Pretty cool, and pretty tasty. It was a little on the sweet side for me, but still not that sweet. For the average person it’d probably be fine. I generally get drinks with only 1/3 sugar (微糖). For my cousin’s son’s birthday they brought out a cute little ice cream bowl. It wasn’t anything special, but it was pretty. Anyways, I totally recommend this place. Very good.